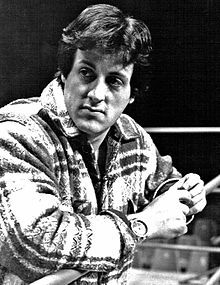 'S e cleasaiche às na Stàitean Aonaichte a tha ann an Sylvester Gardenzio Stallone (Eabhraig Nuadh, 6 an t-Iuchar 1946). Ged an do rugadh e ann an Eabhraig Nuadh, anns na Stàitean Aonaichte, thogadh e ann am Philadelphia. Dh'imrich an t-athair aige, Frank Stallone, Sr., às an Eadailt nuair a bha e òg. Tha a bhràthair, Frank Stallone, na actair is na sheinneadair. Chaidh aodann Sylvester Stallone a ghoirteachadh aig breith aige, mar sin tha pàirt den bhile, den teanga is den smigead air clì an aodainn aige air an neartachadh. Nuair a bha e na bhalach òg, bha trioblaidean mòra aige air sgàth 's sin. Anns na sgoiltean bha a' chlann a' tarraing as. Ach mar actair 's e seòrsa "trademark" a tha ann an cruth aodann Stallone a-nis, gu h-àraid ma bhios e a' cluich dòrnair. Bha e na oileanach anns an Theater Arts Department aig Oilthigh Mhiami airson trì bliadhna ach cha do chrìochnaich e sin air sgàth 's gun robh e ag iarraidh feuchainn a bhith na actair. Thòisich e aig aois 25 anns an fhilm The Party at Kitty and Stud's (1970), film a dh'fhàs ainmeil bliadhnaichean as dèidh sin fon ainm Italian Stallion. Dh'fhàs Stallone ainmeil air feadh an t-saoghail leis an fhilm Rocky (1976). san 24mh den Mhàirt 1975 chunnaic e an co-fharpais dòrnaireachd eadar Muhammad Ali is Chuck Wepner. Thug sin buaidh mhòr air, agus aig ceann trì làithean sgrìobh e an sgriobt airson Rocky. Reic e an sgeulachd seo fo chùmhnant gum biodh e fhèin a' cluich Rocky Balboa. Bha am film gu math soirbheachail, bhuannaich e trì duaisean Academy Awards. Air a tharraing à "https://gd.wikipedia.org/w/index.php?title=Sylvester_Stallone&oldid=537604"
Chaidh an duilleag seo a dheasachadh 22 dhen Lùnastal 2017 aig 10:09 turas mu dheireadh.